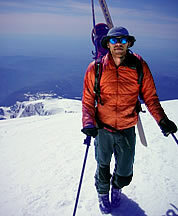 On May 31, 2007, I skied the Sunset Ridge route on Mount Rainier after climbing the mountain via the Kautz Glacier. Two weeks earlier, with Hannah Carrigan and Casey Ruff, I climbed Sunset Ridge after an approach from the West Side Road. We turned back from the 12,500-ft high point adjacent to the Mowich Face due to a combination of time constraint and tortuous terrain between us and Liberty Cap. 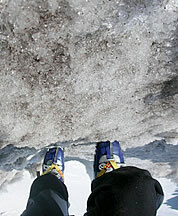 We downclimbed until we were below some icy, steep bulges around 12,000ft and skied from there. After this reconnaissance, I convinced myself that I knew enough to ski the route without climbing it. New plan: up and over from Paradise, don’t forget tennis shoes for the hike to West Side Road. I left Paradise around 2 a.m. accompanied by Phil Fortier. We parted company below Camp Hazard—he headed for one of the Success Couloirs and I headed for Camp Hazard. After a nap, I continued up the Kautz Ice Chute and took a direct line up the Kautz Glacier to Point Success, arriving at 2 p.m. I traversed over Columbia Crest to Liberty Cap by about 4 p.m. I skied down upper Sunset Ridge to 13,300ft, where I was forced off the ridge to the Mowich Face side. The exposure was incredible. To the right was over 3,000ft of exposure on the Mowich Face; to the left an 800-ft cliff above a steep glacier slope in Sunset Amphitheater. I worked my way down steep, soft snow near rocks hugging the ridge. Around 12,700ft, an open slope above the Edmunds Glacier Headwall remained the only obstacle between me and our previous high point. I found that the slope featured only a centimeter of fresh snow over bumpy, blue glacier ice. After a short argument with myself over whether it was skiable, I switched to crampons and traversed across the slope then scrambled down and back up to the 12,500-ft high point on the crest of Sunset Ridge. The snow on Sunset Ridge was wonderfully soft—a 4,100ft descent consisting of 400ft of gentle ridge with striking exposure; a steep roll onto the face where the ridge bifurcates; 600ft of open face; 1,500ft of a sweet, steep gully; then a final 1,300ft of open, fall-line skiing. I traversed the South Mowich and Puyallup Glaciers to the Tahoma Glacier, which I descended below Glacier Island to Tahoma Creek. I lost the trail for a while and darkness fell before I completed the last mile down Tahoma Creek. Hannah met me at the West Side Road when I arrived after 10 p.m. 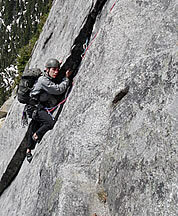 Exhausted, I stopped to nap several times on the drive home, finally arriving in Seattle at 5:30 a.m.
On June 2, 2007, Denise Soderberg and I climbed a potential new route on the West Face of the Dragon Teeth in the northern Enchantments. We ascended the prominent southern rib up intermittent face and crack climbing. Although we encountered scrambling and simul-climbing lower on the rib, the route steepened higher up. From the notch, we climbed the summit pyramid, which offers great views of the surrounding Rat Creek group. Over the past three years, I’ve established three rock climbs on crags in the headwaters of Squire Creek, near Darrington. David Tower and I put up “Center Stage” on the Roan Wall (III, 5.11a) in 2005, a ten pitch route that climbs directly up a remarkable south-facing slab of reddish hue, standing above the open basin below the East Face of Three Fingers. The route is approached via the Squire Creek Pass trail and then game trails on the west/north side of the creek to reach the open basin. In 2006 I established “Flight of the Falcon” (III, 5.10b or 5.9 A0) on the stunning South Face of Salish Peak on impeccable granite with Todd Karner. This route starts at the very toe of the face and follows a series of ramps, corners and short steep crux sections up and left to end at the main ledge one pitch below the top of the wall. From this ledge a long 4th and easy 5th class scramble on the left side reaches the summit. 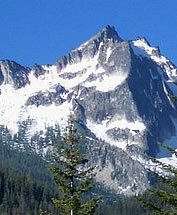 Salish peak stands above the basin where the Roan Wall tops out at, making for a logical link-up of both “Center Stage” and “Flight of the Falcon” that was first done in a day, car to car, by Darin Berdinka and Blake Herrington on the summer solstice of 2007. In 2007, I established “Stage Right” (III, 5.10b) on the obvious right face that forms the right hand perimeter of the Roan Wall, along with Todd Karner, Mark Hanna and David Tower. 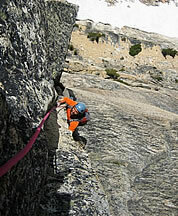 This climb begins about one hundred feet right of “Center Stage” after sharing the first two approach pitches. After the first pitch a long third class ledge gets you to the bottom of the right face proper and then continues up the wall for six more pitches. All of these climbs have established belays and much of the climbing is bolt-protected, but a standard (traditional) rack up to 2-1/2 inches is required when the rare crack appears. The Kumquat Couloir descends 2,600ft from the saddle west of the west summit of The Triad into the Marble Creek cirque. 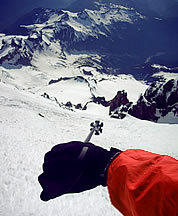 John Roper suggested this ski descent to me in March 2005. After four attempts with various partners between January and April, Phil Fortier and Dan Helmstadter skied the couloir with me on June 20, 2007. On one of the earlier trips the Lost Marbles couloir was skied as an approach route. On another attempt Ross Peritore and I climbed the Kumquat Couloir but found it windloaded and scary. Finding good conditions near Cascade Pass on June 19, the time seemed right to try a more direct approach. Dan, Phil, and I left the Cascade River road at 6 a.m. We hiked the Eldorado Creek route and crossed below the Eldorado Glacier toward The Triad. We climbed to the Kumquat saddle from the south and were greeted by a vertiginous view—a very steep 4,000ft separated us from the bottom of the Marble Creek cirque. The top featured a very steep roll, with crusted and windloaded snow from a storm a few days earlier. I was concerned enough about stability that a belay for the first jump turns seemed like a good idea. After a few turns I was satisfied with the stability, so I had Phil take me off belay, untied, and stuffed the rope into my pack. I wouldn’t have considered dropping into this puppy from above if I hadn’t climbed it previously. A little lower, we headed leftward to get into the gut, where the snow became great corn. We were all very wired at the bottom—what a line! To return to the Eldorado Glacier we climbed 2,300ft to the Triad-Eldorado col, which was crossed by a ledge scramble and rappel. 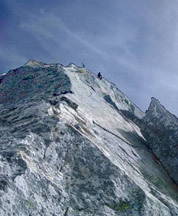 On June 22, 2008, Larry Goldie and I established a new route on the North Arete of Varden Creek Spire, a prominent horn immediately north of Peak 8252 on the East Ridge of Silverstar Mountain near Washington Pass. Upon starting up the base of the arete, we couldn’t believe our good luck as we found pitch after pitch of exceptional climbing on great rock, never straying more than 6-8 feet from the crest of the arete. The middle of the route eases off but after several hundred feet of fourth class, the route begins to steepen again, with climbing continuing in the 5.7-5.9 range on good rock though often covered in lichen. Towards the top we encountered another several hundred feet of class 4 before the final summit tower. 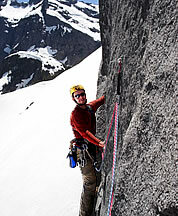 The rock quality changed a bit and we were forced to traverse to the East side of the tower to find suitable climbing. One more long pitch of 5.9 climbing brought us to the coffee table sized summit and the high point of another amazing day in the Cascades. 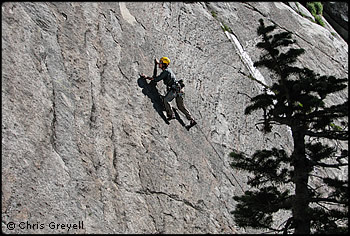 On June 30, 2007, Eric Wehrly and I completed a free ascent of the Kearney-Thomas route on the South Face of Big Kangaroo. After climbing the route in 2006 I swore I would never go back, even though the prospect of freeing this line was somewhat appealing. The thought of fighting through the chimneys and offwidths to get to the good steep stuff put me off. After a while though the idea grew on me, but my partner from the previous climb wanted nothing to do with it. So naturally I turned to Eric, a one man offwidth crusher. He was psyched to check it out, so without much ado, off we went. The approach is straightforward, if a bit spicy with the steep snow coming down the east side of Kangaroo Ridge. I led the first pitch, a rising ramp weaving in and out of loose blocks and large flakes. Eric got the chimney/offwidth, which he calmly dispatched without so much as a grunt. Eric also got the wild eight-foot deep chimney pitch. Lots o’fun. Then I got the long finger crack pitch. It starts with a splitter in a corner, pulls a little bulge (made even more exciting when a foothold broke off—thank god for bomber finger jams), then continues up a steep layback/off-fingers crack—stellar! 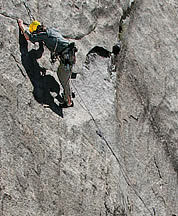 The last crux pitch climbs an undercling out a wide roof to a wild chockstone mantle. Funky but super fun. Eric and I both really enjoyed this route—much better the second time around. The whole thing goes free at 5.11a.